Afternoon Tea - Saving the world from bad baking. Scones are a traditional and delicious afternoon tea, perfect for a kitchen tea, a casual get together, a staff birthday or a business meeting. 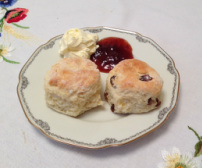 No matter if you need scones for 10 or 100 people - freshly baked and served with cream and jam, scones are always a welcome treat and start from only $5 per person. Email Brigit for a quote.